Sony has positioned the MDR-1000X competitively, with their £330 price, while certainly premium, sitting just £10 above the just-released Bose QuietComfort 35. It's that which will make them a great alternative choice for the travel conscious. We think they're worth every penny. Sony's mission to deliver its best noise-cancelling headphones has lead to the birth of the MDR-1000X. It's a solid name, for a solid pair of noise-cancelling headphones. The MDR-1000X set their sights on the lucrative wireless noise-cancelling segment of the market; they're designed for every business traveller, for those looking to reduce the drone of a flight to instill a sense of calm to enjoy those movies when on the go. We've been travelling and living with the Sony MDR-1000X since their launch and the strong first impressions have not abated: this is an excellent pair of noise-cancelling headphones. The Sony MDR-1000X might look familiar because they sit in the same design framework as the MDR-100ABN headphones which reside in Sony's h.ear on range. While those headphones are designed to be slightly more consumer-focused, the 1000X want to take the title of the best noise-cancelling headphones in their class. The MDR-100ABN ain't half bad at that job, but the MDR-1000X makes a few key changes to the design, ditching the top plastic parts of the band for a more streamlined metal finish, which reduces the bulk slightly and moves them up the premium design stakes a notch. The design is fairly minimalist, choosing those leather-clad sculpted earcups, rather than the more engaging mesh or wood that some cans offer. There is sufficient padding around each earcup and we found enough flexibility to get a comfortable and isolating fit. The good thing about Sony's design is that they stay fairly clean from fingerprints. And that's important, given that the right-hand earcup offers a full range of touch controls, so you don't want a fussy design that collects grime or gets in the way. The left-hand cup offers physical controls, the buttons that control power, noise-cancelling and so on. These have been adapted from the h.ear on models we've seen before, moving from the slightly indistinct round buttons to elongated ones with a rib on them, making them easy to locate and press without looking or thinking about it. Primarily, these are designed as Bluetooth headphones, but all the noise-cancelling functions work when using the wire too - the only thing you lose is the touch controls. Designed for travel, the MDR-1000X fold into a protective semi-hard case, which also offers pouches and loops to accommodate the 3.5mm cable as well as the double adapter for older aircraft. See, we told you Sony was gunning for jetsetters with the MDR-1000X. The secret to the 1000X's success lies in the technology and the options they offer, plus the isolating fit to deliver the substantial noise-cancelling prowess. There are internal and external mics on the MDR-1000X. The interior mics are used to tune the headphones to your head, using the Personal NC Optimiser function. A long press on the NC button will trigger a sound sequence to personally tune the headphones for you. It makes a noticeable difference, so it's well worth actioning to get the best results. External mics on the earcups detect and counter external noise. These are placed in a fairly exposed position on the outside of the cups and can be a little disturbed by wind, as most noise-cancelling headphones are. If you find yourself in a windy environment you can simply turn off noise-cancellation should you find things getting a little unbalanced. The noise-cancelling is designed to filter out those regular background noises, like the hum of aircraft engines or the hubbub of a train. They are super-effective too. We've flown a number of times with these headphones and they're very effective at killing aircraft background noise. The same applies to things like the underground and overground trains. Even sitting at home, they will get rid of just about every noise that might disturb you. The MDR-1000X aren't just about killing all outside noise though. There are a couple of modes to tailor the noise-cancelling experience and let some of the outside in. The first of these is an ambient mode. A press of the button will open up the ambient noise channel and let background noise through. Of course the effectiveness of this depends on the volume of your surroundings and the volume of your music. If your music is loud then that obscures the ambient sound that's coming in. The second mode is ambient voice. This targets voice frequencies and puts an emphasis on spoken ambient noise. This is a little odd at first, but it means you can hear, for example, the announcements on a plane or at an airport, if they are loud enough. Again, if your music is too loud, you'll not hear voice, but if you're at a lower, more relaxed level then it works pretty well - and we've managed to listen to music and people having conversations around us at the same time without a problem. Finally, Sony has added a palm mute function. Placing your hand over the right-hand earcup will dip the music and allow ambient sound in. It's designed to let you have ad hoc conversations with people without shifting your headphones around. Sure, you look a little like Bo' Selecta! 's Craig David, but that hasn't stopped us. The all encompassing approach to noise-cancellation - which Sony calls "Sense Engine" - puts these Sony headphones at the top of the game. Where the obvious choice has always been Bose - and it's Bose QuietComfort cans that you'll often see littered around an aircraft cabin - we'd expect to see a lot more of this Sony model making an appearance. All of the active noise-cancellation and the Bluetooth connection is powered by the on-board battery, charged via the Micro-USB on the left-hand side, which is good for about 20-hours of music. Switching it on gives a battery level report - high, medium, low - so you know when to charge. This isn't just dumb old Bluetooth either, as it supports Sony's proprietary wireless Hi-Res Audio format LDAC. This transmits three times the data of conventional Bluetooth to give you audio that's closer to Hi-Res. You'll need to have a compatible device, however, like one of Sony's Walkman devices or a recent Xperia phone. We tested it out with the Xperia XZ smartphone, which offers two modes: "best effort" or "sound quality". The former basically finds the best bitrate for the environment it is being used in, while "sound quality" throws it all out the window in the pursuit of quality. In real life, we found that the highest sound quality mode was wonderful for home use, but as soon as things get busy, such as when you're walking around and jumping on the train and so on, you'll want to switch to the lower bitrate version to make sure your music doesn't cut-out or skip too much - an issue of wireless connectivity sometimes, which comes down to the source device rather than the headphones. We love the sound quality of the MDR-1000X. Paired with the perfect fit and eliminating of the background noise, it really gives your music room to be heard. Things are bassy, which we don't have a problem with, as we love the meaty crump underpinning those heavy tracks. Sure, the soundstage could be wider and there are better performing headphones out there which offer more sparkle and separation, but we've little to complain about when it comes to the quality results that the MDR-1000X produce. When used as Bluetooth headphones you also get controls through taps and swipes on the right earcup to change the volume and skip tracks. They take some getting used to, but are a handy feature to have. Those results are enhanced when connecting via cable and still powered on. There's a slight by subtle uplift, giving a little more detail as it comes via wire rather than through the air. You can still have the full advantages of noise-cancellation when you're connected via cable, but you will lose the touch controls which are reserved for Bluetooth only. It's in the powered state that the MDR-1000X perform their best, as switching off the MDR-1000X and using them passive headphones via the cable sees a drop in performance, as well as killing these headphones' star feature. Simply put, don't run the battery flat, it's not how these headphones are designed to be used. Sony's aim with the MDR-1000X is to take down market leader Bose. And with a clever application of technology Sony has achieved wonderful results, which easily put them above and beyond the Bose QuietComfort 35, if you're ok with the slightly larger build. With travelling in mind, the MDR-1000X are able to fold, come with a carry case included, can work both wired or wirelessly, and have outstanding noise-cancellation with some very clever and effective features. Importantly the sound quality is great too, as long as you don't listen to them passively when the on-board battery has depleted. 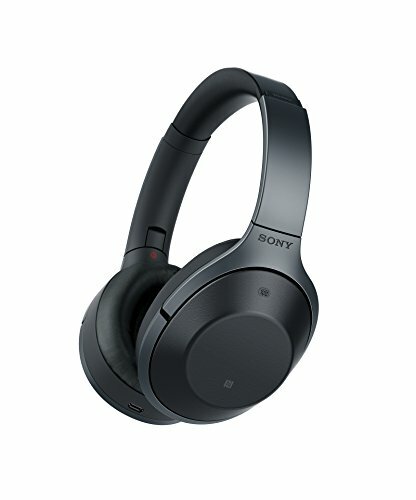 Yet Sony has positioned the MDR-1000X competitively, with their £330 price, while certainly premium, sitting £40 above the just-released Bose QuietComfort 35. It's that which will make them a great alternative option for the travel conscious. We think they're worth every penny.